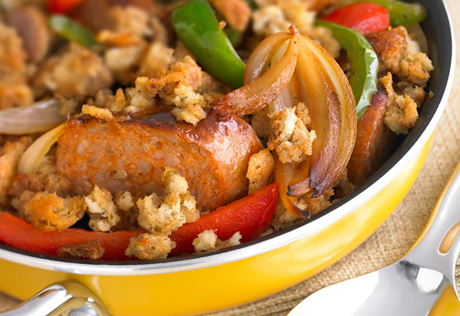 Cook the sausage in a 10-inch skillet over medium-high heat until well browned, stirring often. Pour off any fat. Stir the water, onion and pepper in the skillet and heat to a boil. Reduce the heat to low. Cover and cook for 5 minutes or until the sausage is cooked through. Remove the skillet from the heat. Add the stuffing and mix lightly. Cover and let stand for 5 minutes. *For moister stuffing, increase the water to 1 1/2 cups.